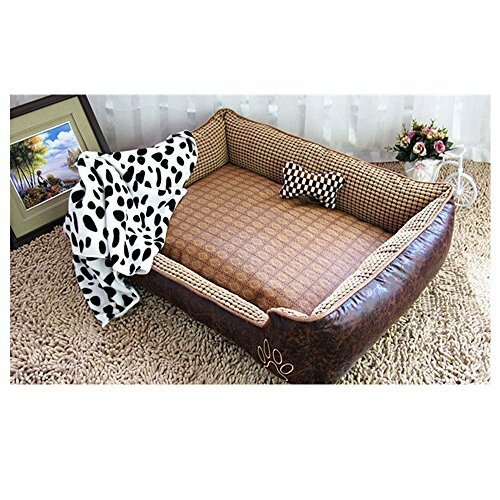 SOFT COZY BED:Made of premium quality micro suede exterior and corn corduroy interior, stuffed with soft polyester fabric, filled with premium 3D PP cotton，supplies high elasticities，high permeabilities and maximum comfort , warmth for your furry friends. A DESIGN EXCELLENT-The exterior is made of tranditional fur velvet using pressure printing techniques, offer anti-fading, anti-pilling and anti-chewing features. It helps insulate the lining and retain heat.The bottom is made of a durable oxford fabric with polyurethane (PUR and PU) coatings techniques,Provides Super Protections Against The Tide and Water. INTIMATE PROTECTION-The Bottom Is Made of a Durable Oxford Fabric with Polyurethane (PUR and PU) Coatings Techniques, Provides Super Protections Against The Tide and Water and provide desired stability;Overstuffed, raised walls for pets nuzzle and rest their head snugly, while also keeping pets feeling secure.